The classes begin Sept. 9 and are held at the teacher's apartment. JACKSON HEIGHTS — A local writer and professor is taking applications for a weekly workshop that focuses on telling the unique stories of Queens residents. The Heightening Stories workshops, which professor and author Nancy Agabian began in 2012, have featured a mix of students from diverse backgrounds and experiences, she said. "Many are taking writing workshops for the first time, while others write for their jobs — as academics, editors or journalists — but wish to write creatively," Agabian said. Participants in the fall 2014 series will focus on the issues of "social change" in their lives. 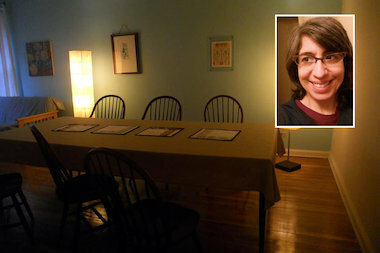 Classes are small and take place in Agabian's Jackson Heights apartment, which helps foster a nurturing environment to develop stories, she said. Workshop members have written everything from a memoir about taking up pole dancing in retirement to a novel about a woman growing up in Richmond Hill in the 1960s. Some have read excerpts from their pieces at Terraza 7 in Elmhurst. Classes begin Sept. 9 for the Community Writing Exercise Studio, which explores "issues of place, community and identity," as well as the book writers' group, which offers critiques on longform work. The creative nonfiction/autobiographical fiction classes begin Sept. 10. Prices range from $5 for the drop-in classes to $475 for a 12-week workshop. Agabian is hosting an open house on the classes at her home on Saturday, Aug. 30 at 2 p.m.
For more information, email Agabian at nancyagabian@yahoo.com.